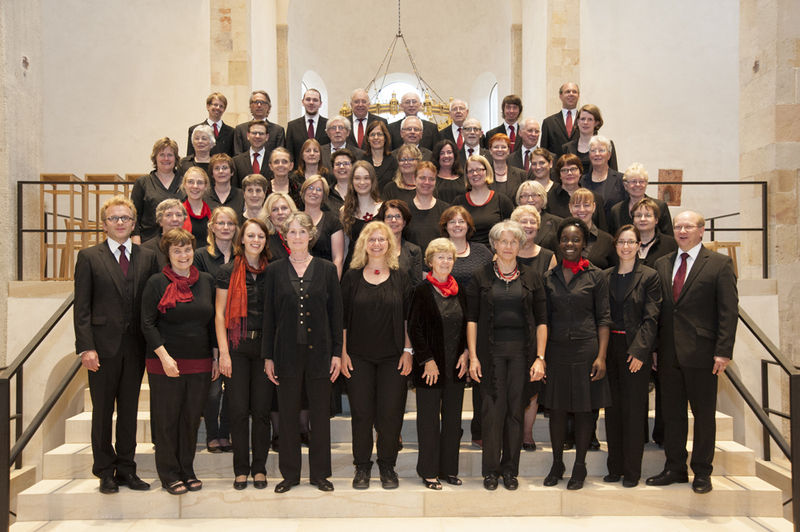 The Cathedral Choir, under the direction of Thomas Viezens, Cathedral Music Director, consists of men and women of varying ages, who work primarily on the care and interpretation of a classical cathedral choral repertoire that includes music from the Renaissance period through to moderate modernism. There is particular emphasis on compositions from the Baroque, Classical Viennese and Romantic periods. A cappella compositions, motets accompanied by the organ and large orchestral masses take place on religious feast days and Sundays. In addition to ongoing work on the repertoire for general masses, significant time is given to the development of concert programmes. As a result, in recent years some lesser-known works such as Rheinberger's "Star of Bethlehem" or Mendelssohn "Lauda Sion" were performed alongside the great passions (John, Matthew, Luke) and Bach's Christmas Oratorio. Choir trips, rehearsal weeks and weekends round off the work of the Cathedral Choir. Trips in the recent past led the Cathedral Choir to Dresden and Rostock, among other places, and, together with the Chamber Choir and the ‘Schola Gregoriana’ Choir, on a trip to northern Italy (including Pavia, Genoa and Milan). A main focus in the spring of 2012 was the recording of the CD "Heavenly Jerusalem - Music from the Middle Ages, Renaissance and the Romantic Period” with romantic motets accompanied by the organ. The motet "Dextera Domini" by César Franck (mp3, 8.7 MB) came from this CD, as did the motet "Dextera Domini" by César Franck (mp3, 8.7 MB). For Easter 2014 the programme featured the Mass in G major for Soloists, Choir and Orchestra by Franz Schubert, while on Whitsunday the Cathedral Choir presented the Missa Sti. Jacobi for Choir and Organ by the contemporary composer Stefan Trenner. In the first part of the jubilee year of the diocese “1200 years of the Diocese of Hildesheim" (15/08/2014 to 22/11/2015) the Cathedral Choir will be kept very busy. In addition to the usual Sunday services alternating with the other Cathedral choirs, the choir can be heard together with the Chamber Choir and the Girls Church Choir on the day of the official return to the Cathedral (15/08), performing Mozart's "Coronation Mass" among other pieces. They will also perform the “Mass for Two Choirs and Two Organs” by Charles-Marie Widor at the organ blessing (16/08), be part of the mass celebrations at the commemoration of the reunification of Germany in the Marktkirche Hannover (mass televised by ZDF on 03/10), perform at the ecumenical service to mark the 50th anniversary of the Decree on Ecumenism (21/11) and, at Christmas, the "Missa pastoritia" for soloists, choir and obbligato organ by the former Hildesheimer and Passauer Cathedral organist, Otto Dunkelberg. In terms of voice training, the singers are coached both individually and in small groups by Christoph Rosenbaum. The requirements for participation: an ability to read music; choral experience welcomed.